Greywater (also spelled graywater, grey water, gray water) is water that has been used in households or other buildings. It is not water from toilets or from washing soiled diapers -this is often called blackwater. Both types of water are often called "wastewater". We dislike this term because of the word "waste". Waste is nothing but an unused resource. Sources of greywater include bathroom sinks, showers, tubs, and washing machines -kitchen sinks can be too but not yet in California. As greywater contains fewer pathogens than blackwater it's generally safer to handle and easier to treat and reuse onsite for landscape or garden irrigation, toilet flushing, and other non-potable (non-drinking) uses. Why use greywater? Greywater reuse is one important solution to the many ecological problems we face today. Using grey water can help reduce stress on water supplies, lower home water usage and costs, and support a thriving landscape. Why irrigate your landscape with large quantities of drinking water when many can plants thrive on reused water? Through the natural water cycle, the Earth has recycled and reused water for millions of years. Reusing greywater reconnects us and our landscapes to this natural water cycle. Californian's produce ~1 billion gallons of greywater everyday! Dish, shower, sink, and laundry water comprise 50-80% of residential greywater. 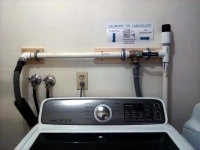 Reusing greywater from laundry and bathroom(s) can save about 15,000 to 36,000 gallons of freshwater each year -a typical family of four produces about ~100 gallons/day of greywater = 36,000 Gallons/year. If just 10% of homes in densely populated Southern CA used their washing machine to irrigate their yards, that would produce around 40 million gallons of greywater a day. If that water went into the ground rather than to wastewater treatment facilities imagine the water and energy savings! Most homes can reduce their water consumption by 16-40% by reusing their greywater. How much you'll save depends on how many sources of greywater you can access and how much you currently irrigate. Minimize contact with greywater. Greywater could potentially contain pathogens so your system should be designed for the water to soak into the ground and not be available for people or animals to drink. You can use greywater on edible plants, but only fruit trees or crops such as corn or raspberries, where the edible part is off the ground. Do not use greywater to irrigate root vegetables or other crops it comes into contact with. Infiltrate greywater into the ground, don’t allow it to pool up or run off -knowing how well water drains into your soil -or the soil percolation rate will help with proper design. Pooling greywater can provide mosquito breeding grounds, as well as a place for human contact with greywater. For more Greywater FAQ go to Greywater Actions' website. Is Greywater Legal in Calfornia? Graywater use is legal in California. In 2009, California’s graywater regulations changed, allowing for lower-cost graywater systems to be installed legally, including some without the need for a permit. Some cities have made the permitting process relatively easy and straightforward, but unfortunately not all places have, so obtaining a permit can still be a barrier for legal greywater systems in CA. We need to keep working to improve our code so people can install all types of legal greywater systems and have it be affordable and easy to do. As of 2017, California’s greywater code is found in Chapter 15 of the California Plumbing Code (CPC) (previously it was in Chapter 16). Before 2009 it was not possible or cost prohibitive to install a legal system, so there were 1.6 million illegal systems in California. Since 2009 it is possible to install several types of systems legally and some don't require a permit. For more Greywater Code go to Greywater Actions' website. What you put down the drain affects the plants you irrigate with greywater! Laundry to landscape: The washing machine pumps greywater directly to plants. 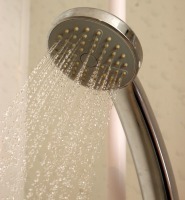 Showerheads: 1-2.5 gpm; sinks 2.2 gpm. Branched Drain: Greywater flows outside by gravity through pipes to mulch basins around trees and shrubs. Pumped system: Greywater drains to surge tank, then is pumped out to plants. Constructed wetland: Greywater passes through wetland, which removes nutrients and transpires water. Sand filter to drip irrigation: Pressurized system that removes particles in greywater with a sand filter, which is automatically cleaned by being backflushed with domestic water. Indoor reuse for toilet flushing: Not allowed under present code, indoor code currently being written. Typically not appropriate for residential, best for commercial and industrial scale systems. Manufactured systems: All systems relatively new, include tank/pump/filter, subsurface drip -which require maintenance and can break. Have an easy way to direct flow back to the sewer/septic (like a 3-way valve). The valve must be labeled. without a permit as long as these guidelines are followed. If required, notification has been provided to the Enforcing Agency regarding the proposed location and installation of a graywater irrigation or disposal system. The design shall allow the user to direct the flow to the irrigation or disposal field or the building sewer. The direction control of the graywater shall be clearly labeled and readily accessible to the user. The installation, change, alteration or repair of the system does not include a potable water connection or a pump and does not affect other building, plumbing, electrical or mechanical components including structural features, egress, fire-life safety, sanitation, potable water supply piping or accessibility. 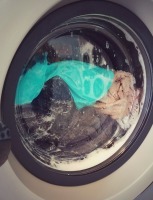 Note: The pump in a clothes washer shall not be considered part of the graywater system. The graywater shall be contained on the site where it is generated. Graywater shall be directed to and contained within an irrigation or disposal field. Graywater may be released above the ground surface provided at least two (2) inches (51 mm) of mulch, rock, or soil, or a solid shield covers the release point. Other methods which provide equivalent separation are also acceptable. Graywater systems shall be designed to minimize contact with humans and domestic pets. Graywater shall not contain hazardous chemicals derived from activities such as cleaning car parts washing greasy or oily rags, or disposing of waste solutions from home photo labs or similar hobbyist or home occupational activities. Exemption from construction permit requirements of this code shall not be deemed to grant authorization for any graywater system to be installed in a manner that violates other provisions of this code or any other laws or ordinances of the Enforcing Agency. An operation and maintenance manual shall be provided. Directions shall indicate the manual is to remain with the building throughout the life of the system and indicate that upon change of ownership or occupancy, the new owner or tenant shall be notified the structure contains a graywater system. We are greywater installers certified by Greywater Action. Greywater Action is a collaborative of educators who have taught thousands of tradespeople and worked with policymakers and water districts to develop codes and incentives for greywater.